LONDON – When Mr. Nathaniel Patray, the Governor of the Central Bank of Liberia addressed the press last Tuesday, he made it a point to clarify to Liberians and the country’s international partners that there was no L$16 Billion Liberian dollars missing as has been erroneously reported in the media. New information and documents in possession of FrontPageAfrica points to the contrary, raising more damning questions than answers regarding the dangers the lack of transparency and accountability on the part of the George Weah-led government is presenting for the administration. At issue is a few missing pieces yet to be explained by the CBL. In particular, the appendix to the contract with the Swedish firm, Crane, contracted by the CBL to print LD10 billion. Contacted by FrontPageAfrica last week, Craig Conrad, Communications Director for the company said it is against Crane’s policy to comment on matters relating to their clients. “Thank you for your interest in Crane Currency. We do not comment on the business of our valued customers and would encourage you to contact the Central Bank of Liberia for the information you are seeking”, Mr. Conrad said, in an email seeking inquiry Wednesday. According to the contract with Crane signed on June 12, 2017, the CBL agreed to purchase banknotes supplied by the Crane, subject to a number of terms and conditions. According to the contract, prices for the order as offered by the company and accepted by the Bank was set at US$10 million. “That the price for the order is Sixty-two United States, fifty-eight cents(62.58) per thousand(1,000 pieces) as provided in Appendix B. The total price for one hundred and sixty-one million, seven hundred and forty thousand(161,740,000) pieces of Liberian dollar banknotes spread across six denominations in volumes enumerated in (Appendix B), Quantity, above, is Ten Million, One Hundred and Twenty-One Thousand, Six Hundred and Eighty Nine United States Dollars(($10,121,689). Regarding payment, CBL was required to make a down payment of forty percent of the total order price at the time of contract signature and the balance shall be settled pro rata against shipping documents or air waybills prior to each delivery. The banknotes, according to the contract was banded in hundred(100s) re-banded in thousands(1000’s), shrink-wrapped and encased per fifty thousand(50,000) notes per lined sealed case. But even amid the new discovery, the lingering unanswered questions regarding the alleged missing containers filled with billions of Liberian currency is refusing to go away. Much in part due to the various contradictions, mixed messages being lost in translation and creating even more confusion and uncertainty, mostly brought on by the government itself. The minister said in November of 2017, the investigation had determined and confirmed that a batch of banknotes came in the country – just before the current president George Manneh Weah assumed office. What is complicating public’s perceptions and making it difficult for anyone to believe the CBL’s assertions that all the money is accounted for and in its vault is the realities many consumers are having to deal with on a daily basis. Banks are rationing how much money to dole out to customers amid concerns that there is actually a shortage of local and foreign currency on the market. Customers are regularly being told that there is simply not enough local currency in the country, thus begging the question if the LD 15.5 billion is in the vault at the CBL, why is there a shortage of currency. Questions are also being raised as to where information Minister Nagbe got his information from regarding printing of monies in China, Lebanon and South Africa. More importantly, if all the monies were printed by Crane as the CBL’s suggest, where was the unauthorized or counterfeit money printed. “It makes no sense that these two countries names just entered the investigation or discussion,” a bystander opined Thursday. This come as new documents and information suggest a separate printing of bills from South Africa. FrontPageAfrica recently receive a communication from a printing company in South Africa to Mr. Richard Walker, Director General for Support Services Operations at the CBL who is responsible for organizing directing, and coordinating the plans, programs and logistical activities of the Bank – which include general services, maintenance, and procurement. A staffer whose name is being crossed out to protect sources, informed Mr. Walker that there is a a big variance in the security features between the Liberian 100 dollar bills printed in Sweden and the one printed in South Africa. To date, the CBL has note made any mention of monies printed in South Africa. However, Minister Nagbe previously in stating that the object of the government investigation is to determine how much money was printed listed Sweden, China and Lebanon as possible countries where the monies were printed. The CBL has gone on record to state that the total amount of money printed and placed in reserve vaults of the bank was L$15.5 billion from 2016-2018.” What is not clear is whether Crane was also contracted to print the first LD5 billion. It is also unclear whether the bank received permission from the Legislature to print the LD$10,359,750,000 printed and received by CBL between Oct 2017-April 2018. CBL records obtained by FrontPageAfrica suggest that the following shipment of Liberian dollars were received: October 2017 – 450,000,000; November 2017 – 299,000,000; DECEMBER 2017 – 4,236,000,000; January 2018 – 3,600,000,000; February 2018 – 1,400,000,000; April 2018 – 374,750,000,000; TOTAL – LD$10,359,750. 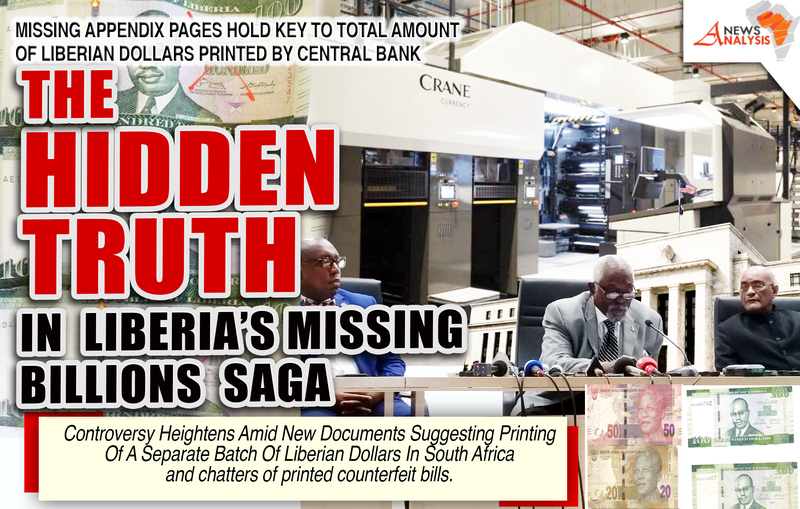 FrontPageAfrica has meanwhile learned that the request for LD50M pieces was made in 2016 and between 2017 and 2018, request was made for 161.74 million pieces but 163,720,000 pieces were actually printed. Compounding the controversy is an earlier revelation made by former CBL governor when he appeared for his confirmation hearing before the Senate Committee on Banking and Currency and revealed that about LD$9 billion was missing in circulation. Mr. Weeks explained at the time that the total amount of money that should be or is in circulation is LD$11 billion of which 9 billion could not be accounted for. Weeks told the Senate committee at the time that only LD$2 billion was in circulation which precipitated the bank making requests from the printing of new banknotes. Mr. Weeks said due to the limited amount of money in circulation, it was difficult to replace the mutilated banknotes on the market. The controversy has drawn the attention of the US Federal Reserves which last week order a freeze of Liberia’s Central Bank account. The US Federal Reserve in New York responsible for the Central Bank of Liberia’s foreign transfers and payments, temporarily put a hold on all transactions with the CBL until the CBL can clarify the instruction from the Monrovia City Court about the bank officials linked to the L$16 billion scandal. CBL sources confirmed to FPA last week that the Feds have expressed concerns about multiple reports in the local and international press regarding the alleged disappearance of millions of dollars in local currency. The Feds are said to be particularly concerned about the mention of Mr. Charles Sirleaf, who along with some 29 bank officials including the former Governor Milton Weeks have been barred from traveling by the Monrovia City Court. Mr. Sirleaf, the bank’s Deputy Governor is responsible for Finance, Banking and General Services Departments. His signature is said to be key to all major foreign transfer payments out of Liberia. Thus, the Feds are said to be uncomfortable dealing with Liberia without a legitimate signatory. Multiple sources confirmed to FrontPageAfrica Monday that several of Liberia’s stakeholders including the International Monetary Fund (IMF) have been raising red flags and concerns that those under investigation should not be involve in the day-to-day operations of the CBL particularly regarding the US Federal Reserve. President George Manneh Weah recently established a Special Presidential Committee to probe the mysterious disappearance of L$16 billion from the vault of the Central Bank of Liberia (CBL) and the Monrovia City Court last week restricted the movement of 35 employees of the bank pending the outcome of the investigation. The involvement of the court was triggered by a Writ of Ne-Exeat Republica prayed for by authorities at the Ministry of Justice (MoJ) to restrain persons of interest from leaving the jurisdiction of the court pending an action. While many remain skeptical about the probe leading to answers about the missing billions, the committee looking into the matter appear to be struggling to erase public perceptions about their credibility. Two members of the committee – Mr. Alex Cuffy and Charles Gibson are being dogged by conflict of interest and dodginess. Alex Cuffy is the brother of Madam Celia Cuffy Brown, who was acting head of the National Port Authority (NPA) when billions of local currencies reportedly came into the country. 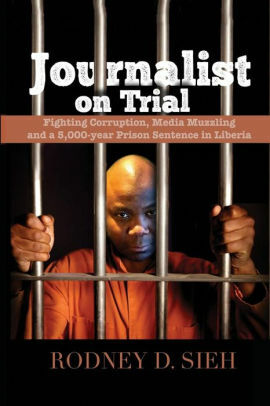 For the foreseeable future, many Liberians remain perplexed about the direction of the missing billions investigation even amid lingering questions over the government’s sincerity toward getting to the bottom of a saga creating a toll of image issues for the Weah-led government.